Manufactured from modern Dobby material this backpack is customised with Trekk zip pullers and branding. The main compartment has plenty of room for all your needs, there is a padded laptop compartment, a valuables pockets and an organiser in the front pocket. 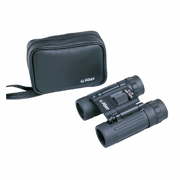 Imprint Area : Screen: Top pocket 100mm(w) x 60mm(h). Front pocket 60mm(w) x 150mm(h). Embroidery: Centred on front pocket: 60mm Dia. Other Methods: Contact your decorator for applicability and size. 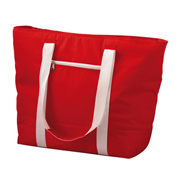 600D polypropylene, zippered insulated compartment with divider and front pocket. Supplied in polybag. 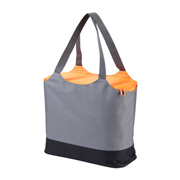 600D polypropylene, insulated cooler with dividers, zippered side compartments and 2 person setting. Supplied in polybag. 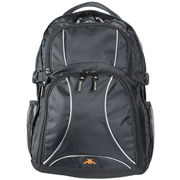 600D polypropylene 2 tone material with insulated cooler bag and front buckled compartment. Supplied in polybag. 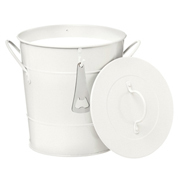 Bucket and lid made from galvanized iron with an insulated cooler bucket inside to keep drinks cold. 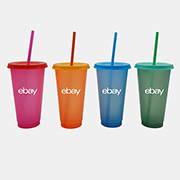 Inner liner is BPA free. 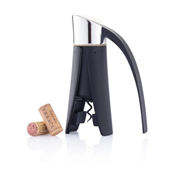 Supplied with a stainless steel bottle opener which hangs on the side. Supplied in brown box. Black collapsible umbrella in plastic tube, with LED torch. 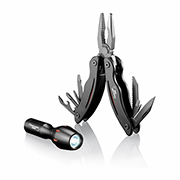 Includes 2 x batteries. Supplied in black box. 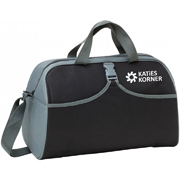 Dual cooler consists of large coloured 300D removable insulated PEVA cooler compartment and grey 600D tote bag with 2 carry handles. Supplied in polybag. 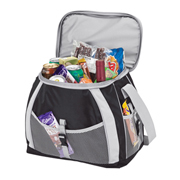 600D polypropylene, 3 piece BBQ set with large zippered insulated compartment, additional external pockets and long shoulder strap. Supplied in polybag. 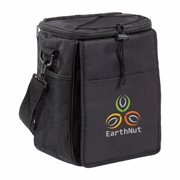 24 litre insulated cooler made in a black spotted suede look material. 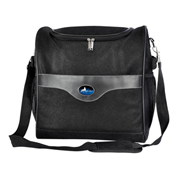 Zippered main compartment, open pocket and side mesh pockets with front badge for decoration. Supplied in polybag. 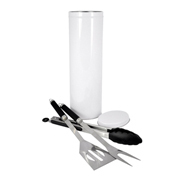 3 piece set consists of stainless steel spatula, fork and tongs with silicone handles packed into a white storage tin. 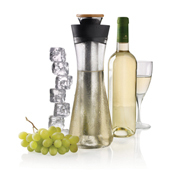 Supplied in white gift box with design. Black fabric frame designed to display two portrait 10 x 15cm photos. Supplied in polybag. 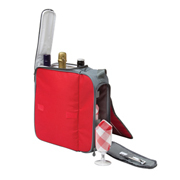 Gel ice bag slides into the D837 wine coat. 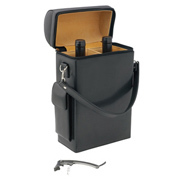 2 Bottle wine carrier in black bonded leather, tan suede interior and includes a stainless steel corkscrew/bottle opener. Leather swing tag makes for easy decoration. 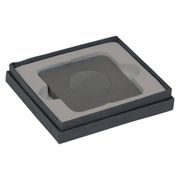 Supplied in 2 piece black gift box. 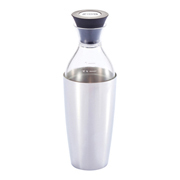 Automatic pepper mill with stainless steel body. Supplied in polybag. 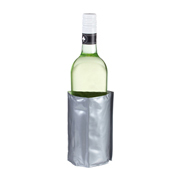 600D polypropylene cooler bag with aluminium foil insulation, 32 litre capacity, 2 x 150ml freezer blocks. Supplied in polybag. 3W LED torch in a strong aluminium body. 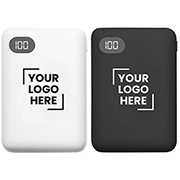 The silicone sleeve provides protection from scratches and allows you to hang your light where needed. 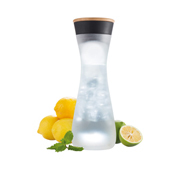 Registered Design® Supplied in retail packaging. Delivery: Air: 2-3 weeks, Sea: 5-6 weeks. 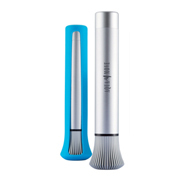 1W LED torch in a strong aluminium body. 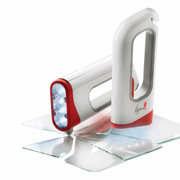 The silicone sleeve provides protection from scratches and allows you to hang your light where needed. 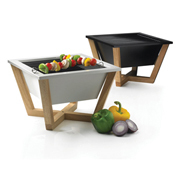 Registered Design® Supplied in retail Packaging. 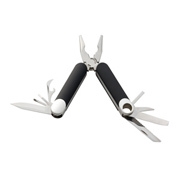 Stainless steel 9 function multi tool with black pouch and velcro closure. Supplied in black box. 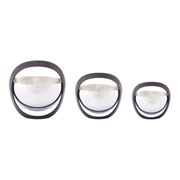 4 piece coaster set with mirror finish centre for engraving. Supplied in black gift box. 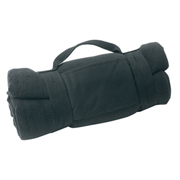 Compact 150cm x 130cm blanket rolls up with double velcro closure straps, printing patch and carry handle. Supplied in polybag. 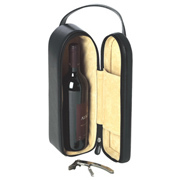 Black bonded leather, tan suede interior and includes a stainless steel corkscrew/bottle opener. Leather swing tag makes for easy decoration. Supplied in 2 piece black gift box. 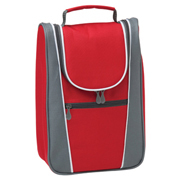 420D polyester cooler bag, 21 litre capacity, insulated inside with pockets and zippered main compartment. Supplied in polybag.